Online Magazine for Women – Informative, Entertaining, Intelligent! It’s official: Rosé wine is trending. In big-city bars and upscale bistros, Rosé is now at the top of the wine list. But make no mistake about it: this is not the sweet, cheap White Zinfandel that’s given pink wine a bad name in North America. These are crisp, dry wines from places like Provence, Tavel and Mendoza. 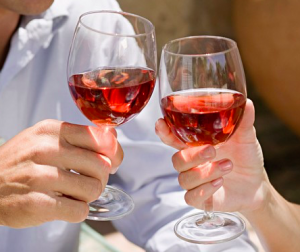 “Real” Rosés are dry wines traditionally made and consumed as the “wine of summer” in Europe. They show delicate fruit notes — think strawberries, cherries or melon — and finish crisp and clean. 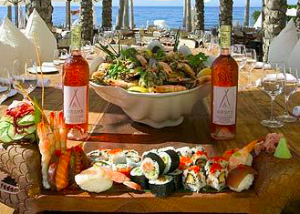 If you haven’t enjoyed a chilled glass of Rosé by the pool, with brunch, or as an aperitif, then it’s high time you did. TIP: Rosés are meant to be consumed young and fresh, so look for vintage dates just a year or two old. And you don’t have to spend a lot: there are plenty of nice still Rosés in the $10-$14 range, and sparkling from $16-$20. Rosé wines can be made from almost any red grapes, but typically use Grenache, Mourvèdre or Pinot Noir. The juice from these grapes is clear, but picks up pigmentation as it soaks with the skins. So very simply, the amount of skin contact determines the depth of color in the finished wine. That’s why you’ll see Rosés that vary in color from pale salmon almost to magenta. And don’t forget the pink bubblies. While Rosé Champagne starts at $40 and can go much higher, there are great pink sparkling wines from Burgundy (called Cremant de Bourgogne), Alsace (Cremant d’Alsace), Spain (Brut Rosé Cava), and of course, California and Washington. Pink wines are great for sipping, but also make good food wines. Try them with an appetizer like Smoked Salmon and Boursin Cheese Crostini, or a tray of fruit, nuts and soft cheeses. Grapes can be tricky little devils. In one bottle they can have you believing one thing — “this grape tastes like lime and grapefruit” — and in another bottle it’s anything but. Well, what happened is that this grape, Sauvignon Blanc, changes style as often as my daughter changes her clothes. Sauv Blanc can be bold and aggressive, like a young career woman on the rise, or refined and sophisticated, like one of those lucky women who look cool and elegant no matter the occasion. You’ve probably guessed that my two players here are New Zealand Sauvignon Blanc — that’s the aggressive one — and the white wine of the France’s Bordeaux region. The wine that I loved recently, and launched me into this barely-plausible analogy, is Chateau Guibon Bordeaux Blanc 2010. Chateau Guibon is part of the Andre Lurton wine family, and it’s a very extended family. The Lurton’s have been in Bordeaux since Lords and Ladies rode through it on horseback, and they now own and manage six or eight Chateau in Bordeaux. Not being content to stay close to home, various family members have launched wineries in 10 other countries, including France, Spain, Australia, Argentina and Chile. So back to the French Lurton. Chateau Guibon comes from the Entre-Deux-Mers appellation, a sub-region of Bordeaux. In this area “between two seas” (the Garonne and Dordogne rivers), white wines can be made from some or all of these grapes: Semillon, Sauvignon Blanc and Muscadelle. Chateau Guibon uses all three. Semillon is the predominant variety, and the blend is beautifully balanced. I liked this wine for its elegance and bright fruit palate. The entry is soft — not like the aggressive attack of New Zealand Sauv Blanc — and some delicate but lush pear and melon linger on the palate. The finish is still crisp (thanks to the Sauv Blanc) but softened by the Semillon in the blend. This is a classically styled blend that would be very appealing to fans of both the New World and Old World style. In fact, I think it beats the heck out of almost every California Sauv Blanc I’ve tasted. And it’s pretty cheap ($13). Yay for that! Take it out for a spin next time you’re tired of your Pinot Grigio or Chardonnay, and Cheers! If you, my loyal reader, have been paying attention, you’ll have noticed that my blog posts are always about wines I’ve enjoyed. Why waste time writing about lousy wines when there are so many good ones, right? And the first thing I do, when I want to write about a wine I’ve enjoyed, is research. I want to learn about the wine’s region, the people who contributed to its creation, and the winery that produced it. So after drinking this really good Bordeaux the other night — Chateau de Rochemorin 2009 – I set out to do my usual. But what I discovered in my research wasn’t “the usual”. 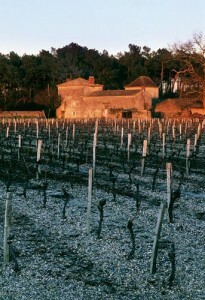 Take the winery’s history, for example: this Chateau traces its roots back to 1520. Really! That’s a long time ago. And over the next 400 years the Chateau at Rochemorin was home to Lords and Ladies, Poets, one of the great philosophers of the Age of Enlightenment, and even an honest-to-God Musketeer! (the dashing, sword-wielding type, not the candy bar type). Vines were planted on Lord Rochemorin’s estate in the region we know as Graves in the 16th century, and good-to-very-good wine was made there continuously for four hundred years. Holy cow! That kinda puts the “Old” into “Old World” wines. Then in 1919, the estate was sold to a lumber baron, and it wasn’t until 1973 that it was rescued by Andre Lurton, a man whose family wine history isn’t too shabby, either. The Lurton’s have been wine producers in Bordeaux since 1650, and at this point there are “no fewer than 17 family members of the currrent generation working in the wine trade today.” In fact, the appellation within Graves where the winery sits, Pessac-Leognan, was created in 1987 after 20 years of lobbying by none other than Andre Lurton. Yesterday I dug into the hard-to-reach places in my wine fridge and found — a half bottle of white Burgundy. I’d forgotten it was there, and still can’t remember who gave it to me (probably a distributor rep trying to win points). But I didn’t care. I had a potentially great bottle of wine to taste, as we sat on our deck on a beautiful summer evening. The wine is William Fevre Chablis Premier Cru Fourchaume 2006, so it’s a white Burgundy from the Chablis region. Many of you may know that the Chardonnay-based wines of Chablis are known for their austere, flinty, style. They typically never see an oak barrel, and the cool climate in northern Burgundy produces plenty of acid in the grapes, and adds ageability to the wines. I was anxious to see how this 2006 was drinking. When I poured it into our glasses, the wine was beautiful to look at. The color was a crystal-clear pale lemon yellow, suggesting a delicate palate to follow. Chateau Petrus or Chateau El Cheapo? H ere’s a cute story reported by Wine Spectator’s blog, “Unfiltered.” It concerns a wine that’s surely the world’s most expensive Merlot. • A young lady in France was caught last month trying to get a discount on a few bottles of Château Pétrus, switching the barcodes on the $3,300 bottles with ones on bottles priced $3.50. This occurred at a Dordogne outlet of the supermarket Leclerc; the company’s wine buyer said such occurrences are common. I converted a whole room full of people. But don’t be thinking we were saying “Hail Mary’s” when we were done. Here’s what I did: I was hosting a summer-time wine tasting, and when I say “summer” I mean 90 degree temps plus 90 percent humidity. This is the kind of weather that makes you want to float in a pool with a very cold drink in your hand. So predictably, my wine list included a snappy, grapefruit-y Chilean Sauvignon Blanc. But it also included Le Grand Bouqueteau Chinon Rose 2010. This wine is a beautiful pale salmon-pink color, and for many American wine drinkers, pink wine = sweet wine. At least out here in the Great American Heartland, the vast majority of pink wine is White Zinfandel, which my regular, wine-taste-attending customers wouldn’t touch with a ten foot straw. So when I pulled out the Chinon Rose they looked at me like the heat had cooked my brain. But when I poured it, and they tasted it, their faces lit up. This rose comes from the Chinon appellation, which is tucked into the Touraine region of France’s Loire Valley. In Chinon, the most widely-planted red grape is Cabernet Franc, and that’s what this rose is made from. It undergoes the same winemaking process as any other dry wine, except that the skins (the component that gives red wines their color) are removed after soaking with the juice for just a few hours. That’s why the color is so pale. I don’t drink a lot of $1,000 wines. It’s just not in my budget. So I was thrilled when our good friends, Chris Holcombe Cotanch and Bruce Cotanch, invited us to join them to taste their bottle of 1989 Chateau d’Yquem Lur-Saluces. So just in case you don’t know why Yquem, and Yquem in this vintage, is such a treat, let me give you some history. “History” is the key word. Chateau d’Yquem is a French wine and winery that dates back to 1593. Yes, that’s more than four centuries ago. Here in the Americas, we weren’t even growing subsistence crops, let alone a luxury item like wine. And in the Chateau d’Yquem vineyards in southeast Bordeaux, the dessert wine made from the Semillon and Sauvignon Blanc grapes that they planted in the 16th century earned them an international reputation. By the late 1700′s, our own Thomas Jefferson wanted to visit this prestigious winery, and he loved the wine so much that he bought 250 bottles of the 1784 vintage and some extra for George Washington. Wow! The 1784 vintage?? It kinda blows my mind. Raise your hand if you’ve heard of Malbec. Now raise the other hand if you think it’s a wine from Argentina. If you’ve got both hands in the air, you look like a lunatic and you’re only half right. While Argentine Malbec is taking up more and more space on wine store shelves, the grape actually originated in France, where it was one of the six blending grapes used to create Bordeaux. In 1956 a killer frost took 75% of the Malbec crop in France, and while a small region called Cahors replanted, Bordeaux did not. Nowadays, you’ll find a little Malbec in Cahors, and even less in Touraine, a district in the Loire in northern France. I found a bottle called Guy Allion Touraine Malbec Le Poira 2009, and I was too intrigued to ignore it. French Malbec is, after all, a vanishing breed, and the researcher in me was keen to see how the flavor profile of this Old World wine would compare to Mendoza’s New World Malbec. I have to admit tthat I’m in awe of the fine wines of Alsace. They seem elegant, sophisticated, and delightful to drink… so why isn’t anyone drinking them?? First of all, let me explain that Alsace sits on the northern edge of France, but it owes much more to Germany in its winemaking traditions. Alsace’s wine grape growing region is sandwiched between the Vosges Mountains to the west and the Rhine River to the east, so they’re within spitting distance of Germany’s vineyards. The grapes they grow are similar to Germany and Austria — Riesling, Gewurztraminer, Pinot Blanc and Pinot Gris — and unlike the rest of France, the Alsatians label their wines with the grape name instead of the region. So Alsace follows Germany’s wine styles. The area also follows its climate: it’s pretty darn cool up there, but the Vosges Mountains at least protect the vineyards from the worst of the winds and keeps rainfall to a minimum. So despite its cold continental climate, all that sun helps the grapes ripen more than they otherwise would that far north. Champagne Market Leader Setting a New Trend or Making a Mistake? Moët & Chandon is to lower the dosage of its market-leading Brut Impérial from 12 grams per litre to 9 g/l according to its chef de cave Benoît Gouez. This follows the decision by Dom Pérignon’s chef de cave Richard Geoffroy to gradually lower the sugar levels on the prestige cuvée, having dropped the dosage for its late-disgorged Oenothèque Champagnes. Hmmm… I’ve been selling Champagne (the real stuff) for quite a few years. Many of the people who buy it want to “treat themselves to a bottle.” They don’t mind that the price is considerably higher than many other very good sparkling wines — they’re buying it because it’s pricey. They figure that if it’s expensive, it must be good, and that’s what makes Champagne a treat. Problem is, most of those folks don’t drink Champagne, or even wine, very often. That usually means their palates aren’t accustomed to truly dry wines. I’ve heard many say, “I spent a lot of money on Dom Perignon because it was supposed to be so special, and I didn’t even like it.” Yep, it’s too dry and yeasty for their palates.